Mansfield Town are hoping influential centre half and skipper Krystian Pearce will be fit in time for Saturday’s big home local derby with Notts County. 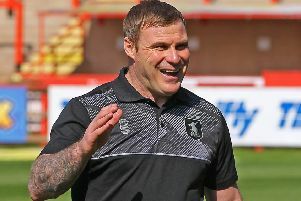 Pearce was forced off at half-time against Bury on Tuesday with a sore groin and missed training today, disrupting boss David Flitcroft’s hopes of working on Saturday’s team shape. The Barbadian international is desperate to play against his old club in such a huge game and Flitcroft said: “It has settled down slightly, but he won’t train today. “We usually do our shape work on a Thursday and make sure we are really clear what the team looks like, but we will put that off until tomorrow. “We will keep monitoring him and see how it settles. We hope he will make it.